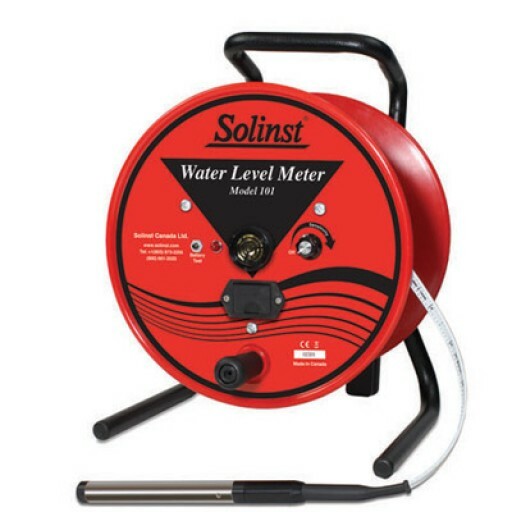 For measuring the depth to water in wells, boreholes, standpipes, and tanks, Model 101 Water Level Meters are the industry standard for portable hand operated meters. They are sturdy, easy to use and read accurately to 1/100 ft. or each millimeter. There are two versions to choose from. 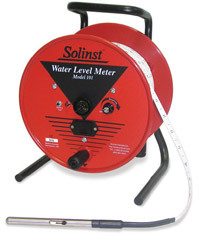 The Model 101 P7 Water Level Meter features a pressure-proof probe rated to 500 psi and laser marked PVDF tape. The Model 101 P2 Water Level Meter features an easy-to-repair probe and heat embossed polyethylene tape. Also available, is the less expensive Model 102 Coaxial Cable Water Level Meter for use in small diameter tubes, and the 102M Mini Water Level Meter on a small, compact reel. 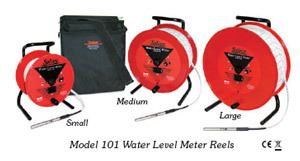 Model 101 Water Level Meters use corrosion proof stainless steel probes attached to permanently marked flat tape, fitted on a well-balanced reel. They are powered by a standard 9 volt battery. The probes incorporate an insulating gap between electrodes. When contact is made with water, the circuit is completed, activating a loud buzzer and a light. The water level is then determined by taking a reading directly from the tape at the top of the well casing or borehole. A sensitivity control allows the buzzer to be turned off while in cascading water, and ensures a clear signal in both high and low conductivity conditions. The Model 101 P7 Water Level Meter uses extremely durable, PVDF flat tape, traceable to NIST and EU measurement standards. Each tape conductor contains 13 strands of stainless steel, and 6 strands of copper-coated steel, making the tape non-stretch and high in tensile strength and electrical efficiency. The tape has a thick dog bone design that prevents adherence to wet surfaces, and allows it to hang straight in application. The tape is also easy to splice. The 3/8" (10 mm) tapes come with permanent laser markings every 1/100 ft. or each millimeter. LM2: Feet and tenths: with markings every 1/100 ft. The P2 Probe is shielded in design to reduce or eliminate false readings in cascading water. The probe consists of a stainless steel body with a neoprene heat shrink seal. It is not suitable for submergence to any significant depth. Its simple design makes it easy to repair. The Model 101 P2 Water Level Meter uses high quality polyethylene tape that reels smoothly, remains flexible and hangs straight in the well. Heat embossed marking each millimeter or 1/100 ft. allow accurate readings. The 3/8" (10 mm) wide tapes come in lengths up to 6000 ft. (1800 m). Seven stranded stainless steel conductors resist corrosion, provide strength and are non-stretch. They make the tape very easy to repair and splice. The dog-bone design reduces adherence to wet surfaces. M2 Feet and tenths: with markings every 1/100 ft.
Power Reels: Power reels can be very useful to allow faster or less strenuous operation of longer lengths of tape. Carrying Case: Small and medium padded nylon carrying cases are available, as an optional extra. Their design has a convenient shoulder strap, zippered front pocket, zippered top, and a grommet in the base to prevent moisture build-up. Replacement Parts: Replacement probes, tapes and other spare parts are available. 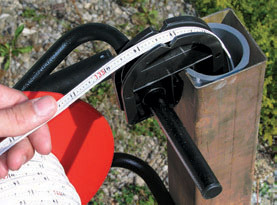 A tape guide is provided with each Meter. It protects the tape from damage on rough edges of well casing and ensures easy, consistent measurements, regardless of who takes the readings. 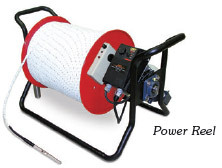 It can also provide reel support on the casing.